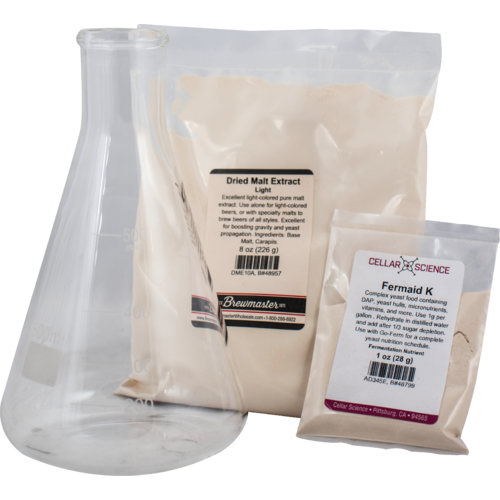 500ml Erlenmeyer flask, 1/2lb light dried malt extract & 1oz Fermaid K (Yeast Nutrient). This starter kit is for growing liquid yeast starters. The idea is that the starter acts as a mini batch of beer where the yeast cells replicate before being pitched into your 5 gallon batch. More yeast means fermentation starts faster. The bacteria and wild yeast that got into your beer during the transfer from kettle to fermenter have less chance of creating a negative flavor impact upon your beer. As others have mentioned, this is not large enough. 500ml of starter is plenty for a 5 gallon batch, but boiling it in a 500ml flask is asking for trouble. Even if you only boil 400ml of wort in the 500ml flask there's almost no way to avoid a boil over since the flask is so small. Sure, you could use the suggested double boiler method--and that will catch your boil over and minimize any messes, but it's still likely to boil over, so why not just size up? I make 500ml starters in a 1000ml size flask instead. I use low heat and place the flask right on my gas stove burner, no double boiler needed. It works very well. 500 ml is TOO small for a yeast starter vessel. I made a yeast starter using this product, followed the instructions and it blew the foil lid off the top and made a big mess. More beer should rethink this product as a "starter kit". and you should Take my lesson learned advice and buy the 1000 ml version. I wish I could have my money back or trade this flask in for a 1000 ml. Has worked well for me but have now went with a bigger flask.